Panicale is a small town in Umbria, Italy. 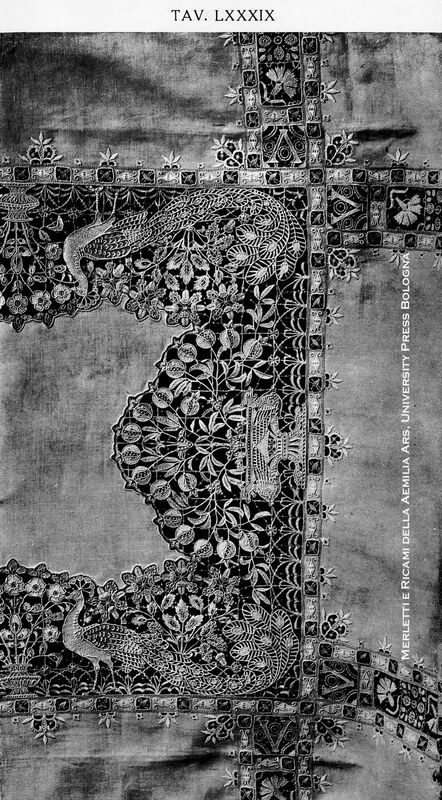 It is where an Italian lady by the name of Anita Belleschi Grifoni founded a school of embroidery and named it Ars Panicalensis [Art of Panicale] in the early 1930s. 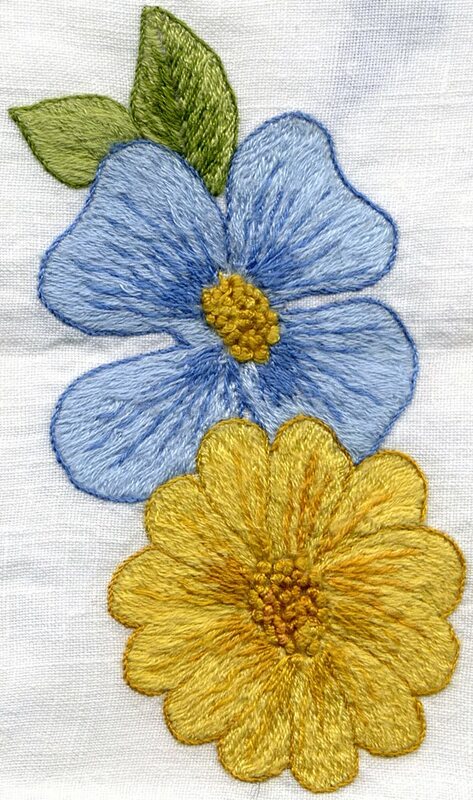 Born in Panicale in 1889, Anita lost her mother at a young age and was then taken in by the Institute of the Sacred Heart of Jesus Parish were she received her education and was taught embroidery. When she was in her forties, Anita was asked to restore a veil owned by the Countess Barabino di LeMura. Whether the veil was Venetian or French is unclear, in any event Anita was then inspired to start a revival of the technique of Embroidery on Tulle. She studied many antique pieces at the Collegiate Church of St. Michael Archangel and in other local churches and the embroidery school was born. Anita's designs were of typical 19th century taste: mostly floral motifs enriched by volutes and festoons, or birds of paradise on flowering branches, love knots, ribbons, landscapes, swallows and rural elements. The school provided a means for local women to earn some financial and moral independence by making and selling their work. Anita was so convinced of the potential of Ars Panicalensis that she sent some samples to the House of Savoy. As a result, Anita and her daughter embroidered the christening robe for Princess Maria Pia of Savoy. The embroideries became well-known and sought after by the upper class and noble families and the school was commissioned to do bridal veils, tablecloths and other items destined not only for individual use but also for Embassies and many pieces went out to foreign markets. Today you can see many of these works in the Panicale Tulle Museum in the Church of S. Agostino in Piazza Regina Margherita, Panicale. A few photos are here. Paola Matteucci, a master of the technique of Ars Panicalensis consults and assists in the management and promotion of the museum. She also teaches courses on the technique and in 2004, wrote for and co-edited the book, Ars Panicalensis, il Museo del Tulle 'Anita Belleschi Grifoni'. I was lucky enough to see her display in Rimini at the Italia Invita Forum. The work was breathtakingly beautiful and the display was the talk of the show. Be sure to watch the slideshow of the display at the Italia Invita Forum in Rimini in 2007. Read about Ars Panicalensis at Tuttoricamo under the 'Techniques' heading, the article is entitled: Embroidery on Tulle. While you're there, check out the book reviews for a review of the book Ars Panicalensis, il Museo del Tulle 'Anita Belleschi Grifoni' and the CD offered by Paola Matteucci in the 'Books' section under the heading: Other Italian Techniques. The book (with text in Italian and English) and the CD (Italian but has some English text - step by step photos are very easy to follow) are available directly from Paola Matteucci's website. She also sells kits! The following photo is of an open work Italian sampler pictured and described in Elisa Ricci's Ricami Italiani Antichi e Moderni (Le Monnier, 1925). 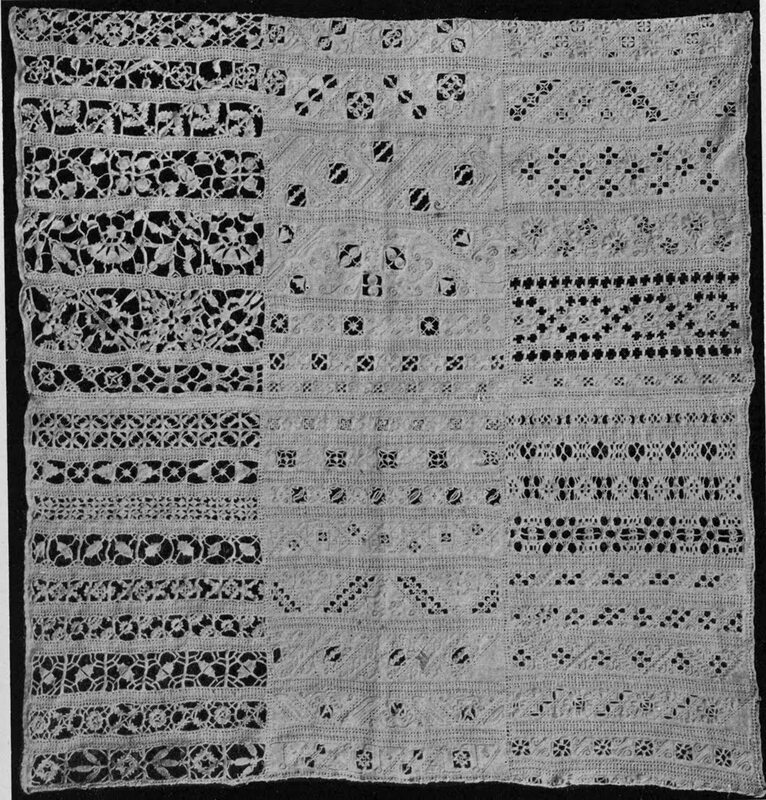 A 17th century sampler of 60 different motifs divided into three columns. All done in white on white, superby executed – perhaps the work of a professional embroiderer or teacher. Reticello, Punto Antico, Drawn Thread work. Elisa Ricci says that it is no longer a "page of notes" but a "page from a dictionary or manual." Indeed this is definitely a sampler one could use as a reference for many, many motifs and stitches. What if it was someone's resumé? You'd hire them on the spot! 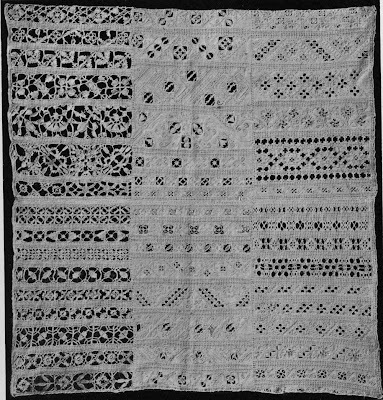 Rows of Four-Sided Stitch are used to divide the motifs and the sections (also as a unit of measure - it's much easier to count squares than individual ground threads!). 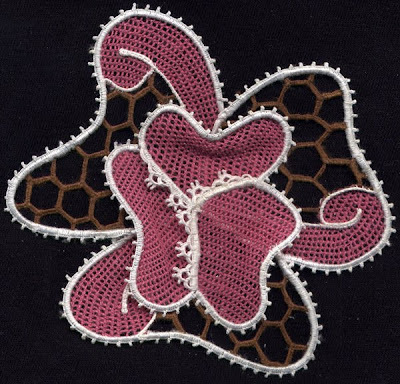 Curl Stitch, Satin Stitch and Buttonhole Stitch in many of its variations. Wouldn't it be lovely to study this one up close? Look at the texture! For some excellent articles on samplers, go to Tuttoricamo and look under the 'History' heading. 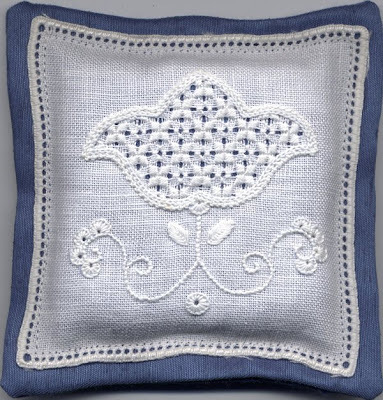 Italian needlework samplers are hard to come by. I'm not sure if this is because they were actually used as 'notebooks' in the sense that Italians embroidered samplers of stitches as the only record of the stitches that they were taught and therefore the samplers were handled more and didn't survive the years. This is only a guess. They are not as commonly found as they are in English-speaking countries and usually not framed on the wall like we do. I found some samplers in my travels to Italy last year, a few were at the Palazzo Davanzati in Florence. 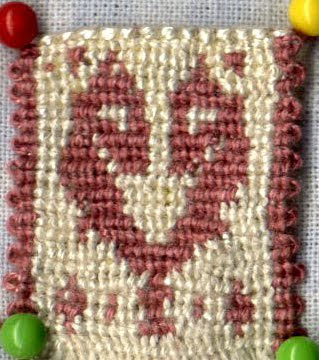 A couple of them looked to be mostly cross stitch, one was a darning sampler, the one I looked at the longest was one with various surface stitches and gold thread in one quarter with needle lace and some Macramé around the edges, another quarter of it was all Drawn Thread work. 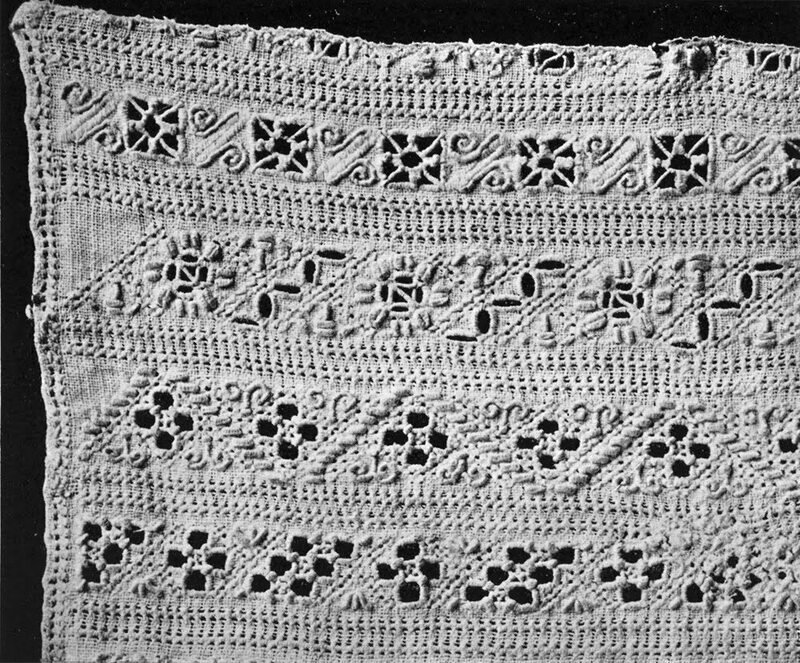 A lot of it was empty space as if it weren't finished – I later recognized this sampler in Elisa Ricci's Old Italian Lace, 1913. (you can find it on page 108 of the pdf file). How I would dearly love to be able to study this sampler up close at length! In Verona at the little Don Mazza Museum in Via D.N. Mazza no. 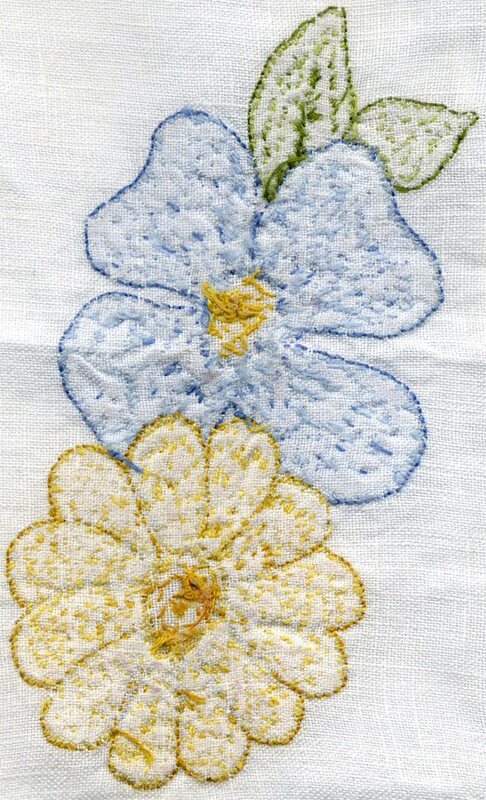 14, there was a delicately stitched sampler done in such tiny stitches on very fine linen. Those bottom letters are made out of eyelets! There is a book I'd like to investigate called: Imparaticci = Samplers: Exercises of embroidery of European and American little girls from the seventeenth century to the nineteenth century by Marina Carmignani, 1986 (text in Italian). It's quite expensive so it's just on my wish list for now. Do you have this book? Can you tell me about the Italian samplers in it? 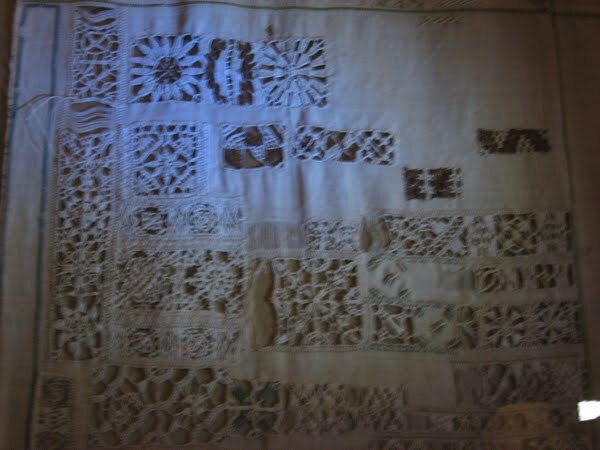 Thank you Armida for your pics of the samplers at the Davanzati Museum, mine did not turn out at all! The Great Countess Matilda of Canossa is one of those historical figures who fascinates me. She lived from 1046 - 1115. Her lands spanned across much of the central northern part of what is Italy today. She was politically active and even hosted a reconciliation between Pope Gregory VII and King Henry IV of Germany at her castle in Canossa. She was apparently quite the military strategist as well, her forces achieving several successful campaigns. In the 1630s her remains were moved to St. Peter's Basilica in a tomb made for her by Gian Lorenzo Bernini and several other artists at the request of Pope Urban VIII. In the 1920s Dr. Maria Bertolani Del Rio, a psychiatrist, had designs recorded from the stonework and architecture of the Canossa castle and surrounding churches. Putting them together with many Romanesque and Carolingian designs found on "Matildic codexes" (the Countess Matilda was responsible for a great many important documents and even had her own biography completed within her lifetime), a book was produced in 1935 called Ars Canusina [Art of Canossa]. Dr. Bertolani Del Rio was the Superintendent for the Antonio Marro scolastic colony, a project of the San Lazzaro Psychiatric Institute in Reggio Emilia. The purpose of the colony was to look after and educate children who had been admitted for psychiatric care or were abandoned by their families. Boys learned various trades and girls were taught embroidery and other textile arts. In 1932 the colony was asked to exhibit works of local tradition in the National Exhibition of Woman's Work. This was when Dr. Bertolani Del Rio merged her two fields of interest: the children and the designs she had been collecting. With the help of the Drawing teacher, Professor Giuseppe Baroni patterns for embroidery were created. Beautiful embroideries stitched by pupils of the colony with the assistance of a few expert embroiderers won the gold medal at the Exhibition. The colony closed down after the Second World War and the trademarked name is now owned by the Comune of Casina and authentic products are made by the Consorzio Ars Canusina. Tuttoricamo has two excellent articles on the history of this technique and the colony under the "Techniques" heading. There are also some technical instructions in the "How its done" section. 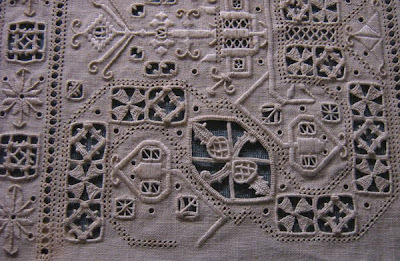 Some examples of Ars Canusina embroideries are here, here, here, here and here. I have been asked to tell you about a project I worked on in 2008. Many of you know (and many of you may not know) that I donate some translation work for the website Tuttoricamo. 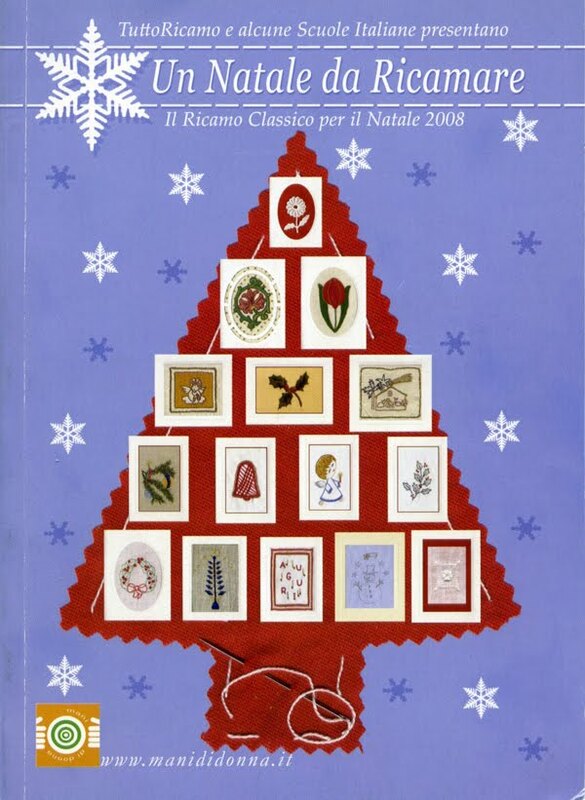 In 2008 the Tuttoricamo ladies wanted to put together a book about Italian embroidery with the proceeds going to charity. Simona Bussiglieri from Mani di Donna had already put together a booklet of cross stitch designs in 2007 and was doing the same for 2008. The ladies from Tuttoricamo sent word around to various embroidery schools asking if anyone would be interested in contributing to this worthy cause. (Proceeds went to the Pediatric Hospital Bambino Gesù of Rome which then used them to help the Bellosquardo House in Rome which houses low-income families from all over Italy and the poorer countries of the world). The response was good and the Tuttoricamo ladies embarked on the daunting task of coordinating and putting together the book: Un Natale da Ricamare 2008 con Tuttoricamo. First a bit of background information: in Italy there are many embroidery and lace making schools. They are run by the various masters and teachers of Italian needlework techniques, usually as a second job, as most of you are aware, embroidery doesn't make anyone rich. These schools are generally in competition with each other, each one vying for students, teaching not just one, but many techniques in an effort to attract pupils. Some courses are carried out over weekends, some on specific days of the week, some over a period of weeks, months or years; in churches, community centres, private homes. Some schools and associations are fortunate enough to have some financial backing from community, provincial or regional funds and therefore have a fixed address and classrooms. It is a difficult way to make a living and the competition is quite fierce. To ask these schools to collaborate together is something that had not been attempted before. Counting on the main goal of charity at Christmas time, the Tuttoricamo ladies went ahead and were successful in getting 13 associations to donate over 30 small patterns to be stitched up as Christmas cards or gifts. The techniques included: Classic Surface Embroidery, Drawn Thread Work, Palestrina Embroidery, Aemilia Ars Needle Lace, Cutwork, Reticello, Shadow Work, Cilaos, Filling Stitches, Bricco Embroidery, Cavandoli Macramé, Bandera Embroidery and Colbert Embroidery. Projects besides numerous Christmas cards were: table runner, table centre, needle book, lingerie envelope, wine bottle carrier, dish carrier, wine bottle drip-stop apron, napkin rings, Christmas tree ornaments, book cover, guest towel, advent calendar, sachet. Everyone donated their time, those who drew the patterns and wrote instructions, those who stitched the models, those who photographed, those who coordinated and me, who translated an English version (available as an insert upon request from Mani di Donna). The booklet is not for beginners, it is assumed that you have some working knowledge of the techniques as limits of space prohibited extensive instructions. It wasn't easy and it was stressful as putting together any publication is. Printing deadlines had to be met and asking people who are donating their time to conform to time restraints is not the easiest thing in the world to do. In the end however, a piece of history was made. 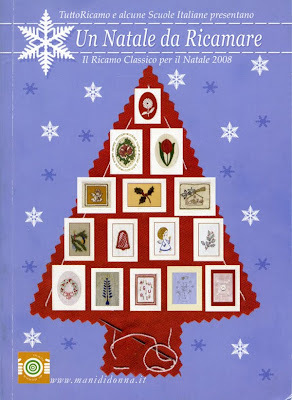 This book represents more than the good will and charity of embroiderers at Christmas, it represents a sisterhood of sharing the art of Italian needlework and presenting it to the English-speaking world. Since I told you about Bricco Embroidery yesterday, it only seems logical to tell you the story of Cavandoli Macramé today. Valentina Cavandoli was an Italian school teacher who came to be the headmistress of a house for poor and/or orphaned children in Turin around the end of the First World War. Many of the children were the healthy offspring of parents with Tuberculosis. There were many houses who cared for these children but we will concentrate on the Casa del Sole [House of the Sun] directed by this special lady. The Casa del Sole was a mansion donated by a clothing manufacturer in memory of his daughter. He also donated enough money to build dormitories, a dining room and shower facilities for the 100 children who lived in the home. Children of both sexes were housed between the ages of 3 and 15. To keep the children busy, Valentina had them create objects in a certain type of Macramé – an art she herself had learned from her great grandmother – which came to be known as Cavandoli. With this technique, the children made accessories for clothing and interior decorating and sold them in charity markets. Each child was assigned a savings book and the money earned from their products was recorded and then given to them upon their leave-taking of the home. The Casa del Sole survived until 1936 when the political and social situation in Italy became too difficult for the mainly Jewish benefactors of the home. Valentina Cavandoli died at the age of 97 in 1969, having received a gold medal of recognition for her life's work in 1961. Cavandoli Macramé is always made of two colours. 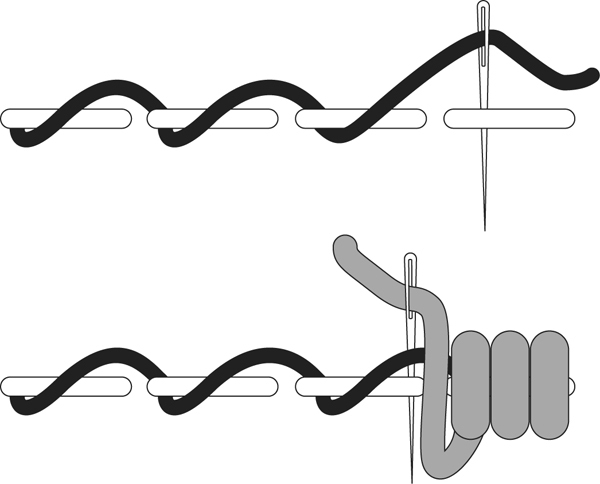 Each stitch consists of two knots, the pattern is created by inverting the knots. 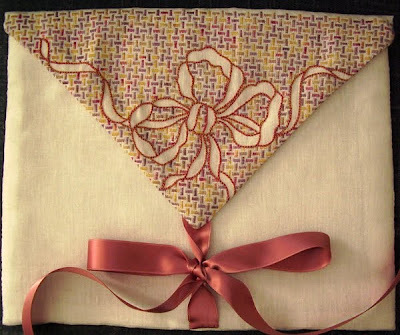 When done in larger pieces, it produces a kind of stiff "fabric", excellent for creating table mats, book covers and borders for pillows, purses, etc. Smaller items can be book marks, eye glasses cases, belts, etc. 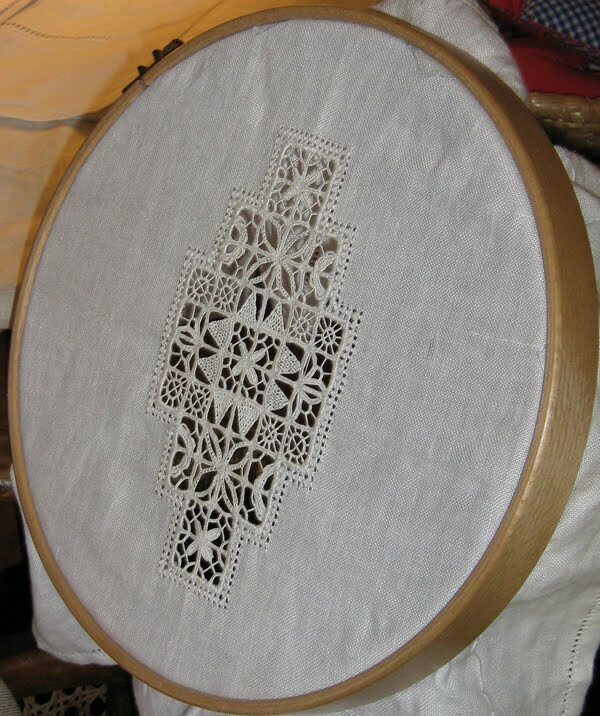 Patterns for single colour cross stitch or filet lace are suitable to use for this technique. I don't recommend starting your first project with so small a thread – I am having a lot of difficulty keeping the work even! To learn more about Cavandoli Macramé, go to Tuttoricamo and look under the 'Techniques' heading. Once there, you can also read a review of the book mentioned above: click on 'Books', then 'Other Italian Techniques'. The Anchor Manual of Needlework has a whole chapter dedicated to 'Cavandoli Work' with photos and technical instructions. In 1913 Countess Tarsilla Petitti started a school for girls in a little town called Bricco de Faule (near Turin) in the Piedmont region of Italy. The people of the town were mostly poor farmers and the object of the school was to educate girls and train them in embroidery so that they could earn a living. The Petitti family was in possession of a sacerdotal robe of richly embroidered fine cambric linen dating back to about the 17th century which they displayed in their chapel. 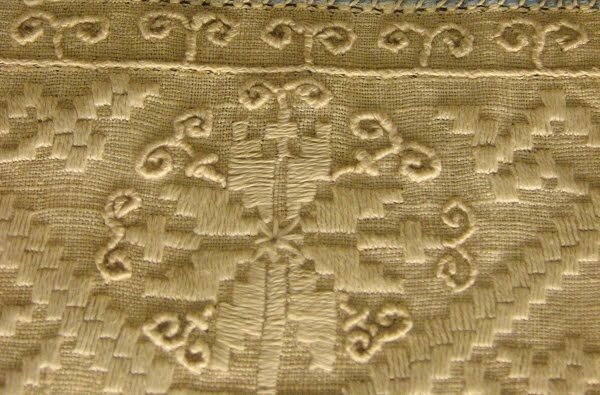 At the time it was made, Church vestments were richly embroidered in what the Italians called Saxony Embroidery (Ricamo di Sassonia) which I strongly suspect is what we know today as Dresden Embroidery. The robe was finely embroidered in white and silver threads with designs of roosters and peacocks, heraldic double-headed eagles, the emblem of Franciscan nuns, leaves and vines and many different types of stylized flowers. Tarsilla Petitti decided to create designs for her students using the robe as inspiration. Her pupils learned traditional embroidery techniques but became especially proficient at Bricco Embroidery as the embroideries born from the designs of the robe became known. Instead of fine cambric, robust undyed homespun cloth made of hemp, cotton or linen was used. Thicker cotton threads replaced the fine white and silver ones of the robe resulting in a completely 'new' style of embroidery. Embroidered clothing done by the girls of the school were sold to the upper classes who were happy to support the project. The outbreak of the First World War robbed the school of its pupils who were needed at home to replace the men who had gone off to war. Tarsilla Petitti then looked to the lower middle class women of the area who needed to supplement their incomes and to local nuns to keep her embroidery workshop open. 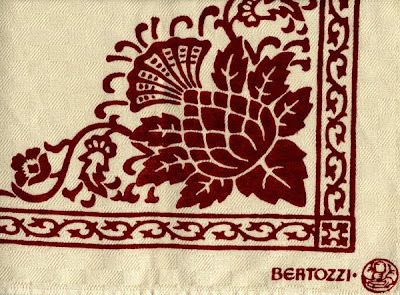 Bricco Embroidery took a gold medal at the 1923 Industrial Agricultural Exposition in Cherasco and became well known throughout Italy and abroad. The Countess died in 1937. This unhappy event and the outbreak of the Second World War signaled the end of her workshop. 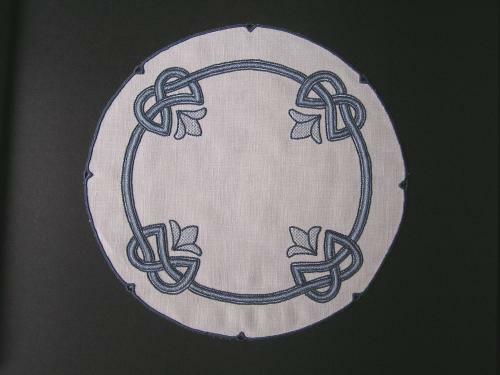 To learn more about Bricco Embroidery, go to Tuttoricamo's website and look under the 'Techniques' heading. While you're there, read a book review of the publication mentioned above: click on 'Books', then 'Other Italian Techniques'. If you have the Anchor Manual of Needlework, there is a little bit written on this technique with a photo in the 'Italian Embroidery' chapter. If you're planning to be in Venice before the 18th of July this year, there is an exhibition on now at the Palazzo Fortuny called La Seta e il Velluto [Silk and Velvet]. There are a number of early 20th century clothing pieces on display including a series of rare Delphos (pleated silk satin dresses) owned by American collectors. 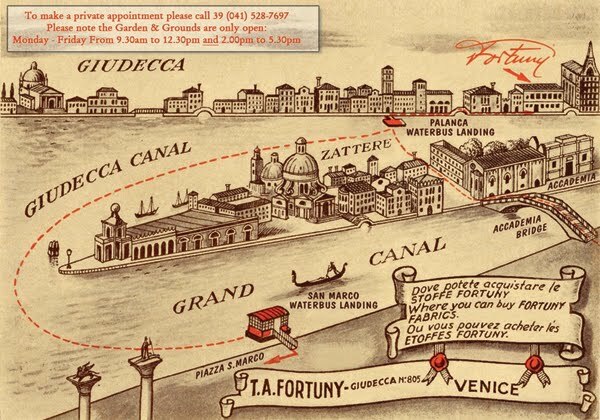 The Palazzo Fortuny is located in the historic centre of Venice near the Rialto bridge at: San Marco 3780, Boat Stop A, S. Angelo, Route 1. The museum is open daily from 10 am to 6 pm but is closed on Tuesdays. Mariano Fortuny was a Spanish artist who became famous in Venice in the early 20th century. Fabrics of his design are still manufactured and sold today, you can see a number of them here. The Venice showroom is now reopened and you can go for a look (and buy fabric!) 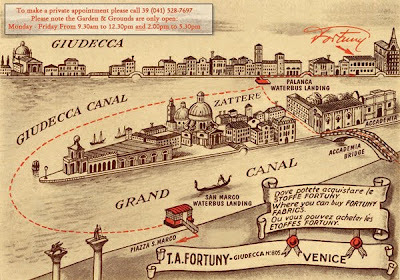 Monday to Friday, between 9:30 am and 12:30 pm and then between 2:30 pm and 5:30 pm on the Giudecca canal at no. 805. The tradition of hand-stamped fabrics goes back far into Italian history, at least to the 1400s if not farther. Some fabrics were stamped to embroider over and some were made just to be used as-is. Embroidery took a long time to produce therefore it was expensive, hand-stamping brought similar results at a lower cost. 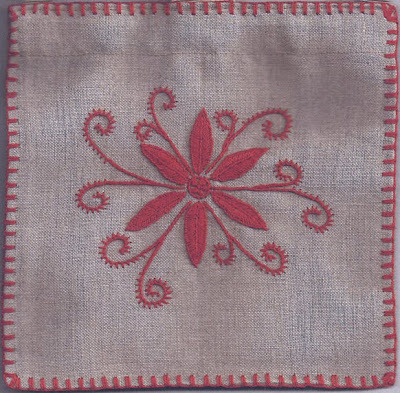 Hand-stamped fabrics were used for table linens, upholstery, household furnishings, animal trappings and even clothing. Traditionally the stamps were hand-carved into pear wood. Dye colours included rust, indigo blue, green and very rarely gold-yellow and brown. Artisan hand-stamped fabrics are still produced today in Italy. This is a pear wood hand-carved stamp from the first part of the 20th century, part of a collection owned by Arnaldo Caprai. Many more can be found in the book: In viaggio con Penelope. A catalogue of many embroideries, laces and textile-related articles owned by Arnaldo Caprai. The area around Gambettola, Italy was especially productive in this art. Watch the video here that shows how the production is carried out, some patterns and also some modern designs. This company specializes in Renaissance patterns and has some interesting slide-shows with English text. To learn more of the history of hand-stamped fabrics in the Romagna region, go to Tuttoricamo and under the 'History' heading, you'll find a fascinating article called 'Hand printed fabric'. There is an online museum of a collection of stamps from all over Europe here. You can visit this museum which is in Via Ugo Foscolo no. 4, Milan, entrance is free. I have not been there but it's on my list of things to do! Parts of what we know today as Italy were ruled by the Byzantines for a number of centuries. This influence is evident in some architecture, mosaics, marble carvings, frescos and... needlework. Bizantina Ars or Byzantine Embroidery (the name Bizantina Ars [Byzantine Art] is actually trademarked) refers to embroidery made to resemble 4th and 5th century mosaics from the Basilicas of Ravenna. You can see the progression of the design from marble carving to stitched piece here. Usually the designs are done as voided work, ie. the backgrounds are filled and the motifs left empty. 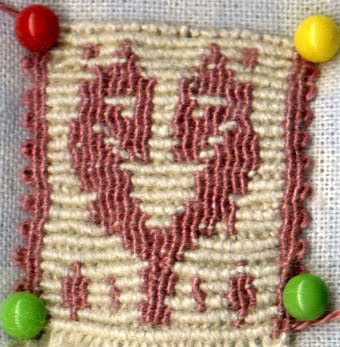 Outlines are done in Stem Stitch, usually in a brown thread (DMC 801) and the filled areas are done in single coloured Punto Stuoia. 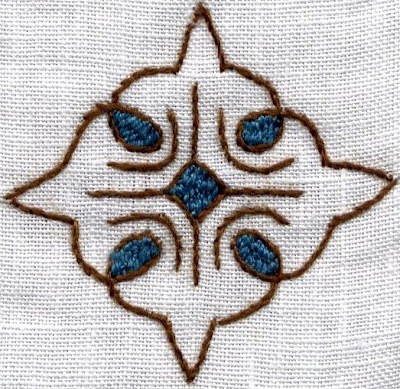 The Anchor Manual of Needlework translates this stitch as Rush Stitch as that is the basic idea of it, it is meant to resemble the pattern of the rushes that covered European floors in ancient times. Single colour fillings are most commonly green, gold, red or blue. A high-count 100% Linen fabric is recommended in an ivory colour. Rush Stitch is similar to Roumanian Couching though it is not meant to be evenly done but rather to have a randomness to it. If you ever find yourself in Ravenna, all the Byzantine mosaics are worth going out of your way for. The churches of San Vitale and San Apollinare in Classe in particular. Treasury of Byzantine Ornament by Dover Publications is a good pattern book to use for this type of needlework. To learn about the history behind Bizantina Ars, go to Tuttoricamo and look under the 'Techniques' heading. For more pictures, check out the Gallery at the Bizantina Ars website. I'm back from a glorious weekend immersed in needlework. I have wanted to take a class with Diane Clements for a long time. She does some beautiful needle lace! As we were toiling away at our less-than-perfect samples I kept thinking about the beautiful laces that I've seen in Italy. My neck and back were aching after only one day - how must those lace makers feel? And in the days of old without ergonomic chairs and good lighting? It really gives you an appreciation for something when you sit in someone else's position. Last year while in Italy I went to visit a master needle lace maker on the island of Burano, near Venice. Lucia Costantini invited us into her home and showed us her art. Oh, and it was definitely art. The exquisite beauty of her pieces made the tears run down my cheeks and I couldn't speak. The work! Countless hours of creation, tiny little masterpieces, large colourful laces, scenes, marine life, symbology... I could have stayed there all day. My stitches will never be this beautiful but it is very nice to have a piece of this art to look at up close and admire! Here you can watch Lucia go through the Museum of Lace on Burano. Even if you cannot understand the history of lace that she recounts, there are lace makers at work to watch and samples of different laces shown. More of Lucia Costantini's lace art can be seen on the Tuttoricamo website, look under "Prominent Characters". 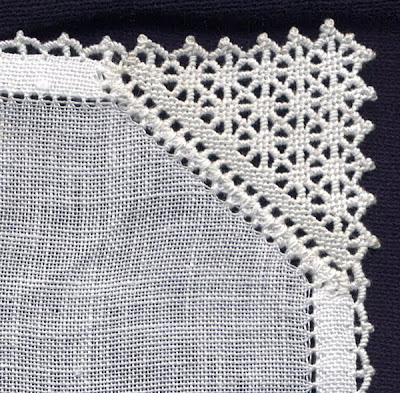 A Venetian Lacemaker is a small book about Lucia, Burano and needle lace by Vima deMarchi Micheli who brought Lucia to the U.S. to teach in the 1990s. Here is the legend of Burano lace. 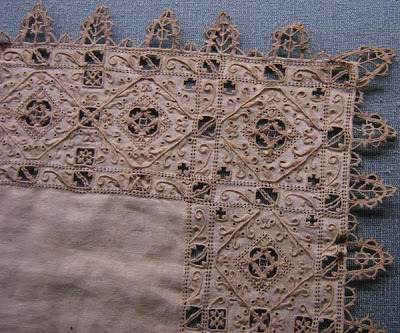 On this page is also a link to the lace museum and how you can visit it. If you go to Venice, you can catch a boat to Burano but beware! Chinese imitation lace is everywhere and will be cheap. If it's authentic, it will be expensive – though even expensive prices do not begin to cover the time, expertise and talent that goes into this amazing art. I'm taking a class with Diane Clements on needle lace. There is a picture of the project we will be working here. I'll post when I return, have a great weekend! Puncetto as it is commonly known today, has many other names, Punto Avorio being one of them. This needle lace is very attractive and though more commonly done in geometric designs, it can be used by the more advanced lacemaker to make curves. It is done in monochrome or even in bright multi-colours as on the traditional costumes of the Valsesia area in Italy. If you've got access to Thérèse de Dillmont's Needlework Encyclopedia (also known as DMC's Complete Encyclopedia of Needlework), look under 'Needlemade laces' and check out the part on 'Knot Stitch Laces'. Look for Punto Avorio. The best way to begin is to use the edge of a piece of fabric to attach to. Later you can try starting the way this lady does in her video. 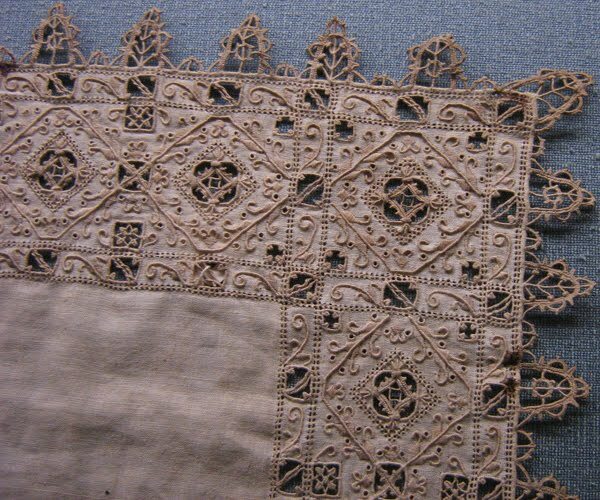 There are a few books on this lace though all the ones I know of are in Italian and are difficult to find. Check out my library listing for titles relating to Puncetto. I have to admit to collecting everyone I have found so there are quite a few... to get you started I would say either the Manuale del puncetto valsesiano or the A scuola di Puncetto Valsesiano but if you are itching to give it a try right away, the Dillmont instructions are good or there are even some instructions in the Anchor Manual of Needlework under "Puncetto Work". For free download of an Italian book from the early 20th century, go to Tuttoricamo, under the 'Books' section, then 'downloadable antique books', then under Amelia Brizzi Ramazzotti, click on the word 'Puncetto'. UPDATE: Unfortunately the Tuttoricamo website is no longer active. You may search ebay for this book, it's called: Il Puncetto, insegnamento pratico illustrato. Last year on April 6th, a terrible earthquake devastated the town of Aquila, Italy and the surrounding regions. Many stitching groups rushed to organize aid of a less urgent nature for the lacemakers of the area. There was even a depository set up at the Italia Invita Forum of Lace and Embroidery in Parma in May to take donations of needlework supplies. A fund was set up for monetary donations. Simona Iannini's house crumbled on top of her and she sustained many injuries, not to mention the loss of everything in her house. Everything she had prepared for the Italia Invita Forum (she and another woman, Rita Fattore were to exhibit pieces of Aquila Bobbin Lace) was lost. Rita Fattore was marginally more fortunate, her son insisted she leave the house after the first quake and so she was saved... but after the second quake a couple of hours later, her house and all it's contents were lost. ...we Aquilani, mountain dwellers and determined, never lost hope of meeting once again to work our beloved lace (...and more). Unfortunately, what was previously done in a day, now takes a month and there were more important priorities like putting a roof over my son’s head! Having partially resolved these kinds of problems, it was time to start over. Fed up with unkept promises, a widespread enough trend, Sunday, March 7th we met at the home of Alessandra Tagliaferri who, by good fortune (and good construction) has her house still intact. In the yard, she and her husband, obviously at their own expense, constructed a delightful wooden cabin. From there we will start over. Via the grapevine of telephone calls we were able to meet again with enthusiasm and emotion. I found it a bit trying, but beautiful and affectionate as always. What do the Aquilani miss? We miss contact, we are divided, split up, dispersed. We miss a place to get together. One walks in the few streets or in the shopping centres searching for familiar faces. We tell ourselves: “Enough sadness, the aftershocks continue, our houses are gone, so are our jobs, we must find ourselves something to do. Let’s start again”. Our Accademy starts over from here, to teach various courses besides lace, to share our passions, to promote new projects and it is open to all those “of good will” and good character. We want to speak positively. Ideas abound. For the record, I would like to thank my “ladies” for having listened to me when I had to vent about the situation for those of us who were wounded. By now we are no longer “odiens” [sorry, I don't know what this means] and we are only an uncomfortable expense for society. Does it seem right that there might not be any compensation? “In the end” I was told “it was hardly a workplace accident.” I was forgetting that ending up under the rubble of a house (mine was reinforced with cement), was our fault. Of course, we could have gotten out of the way! Let’s unite for something which will give us support, even if only moral. But let’s leave the controversies elsewhere, the password is: pragmatism. Our courses will be given with lessons of different [skill] levels, in study groups. I also had two other locations in Montesilvano (Pescara) and Francavilla (Chieti), for giving lessons on Aquila lace, I hope to organize courses on the coast as well, like we have already been able to do in Lanciano. My thanks go to those who are contributing to my moral and occupational reconstruction, more precisely, my pupils and the great help that comes from outside our region. To Alessandra’s cabin, I will bring the materials that you all have sent me which will be available to everyone, we will work to realize artifacts, in the hope of supporting ourselves. I would like to say something to my countrymen: it is not living angry that resolves problems, a smile should not be denied to anyone and can help us move forward. At times I fear that we have forgotten the tragedy of those who lost loved ones and one might think only of one’s material possessions, I believe I can say this in hindsight, and I continue to send a thought to the little ones who are no longer here. I, or rather we, have decided to start over with all our hardships, our long periods of time, our fears. The cabin will be the starting point for creating with our hands, for creating with our hearts, for planning, for growing, for being together. Those who love us, follow us (and help us) otherwise... we are strong enough to get by peacefully all by ourselves. You can see some of Simona's incredible work at her website. Rita Fattore is the co-author of Tombolo Aquilano. If anyone knows what "odiens" are, please post a comment! I have always admired the Italian approach to Macramé. It recalls nothing like what North Americans tend to think of, which are the hemp plant hangers and decorative owls of the 1970s. No, Italians have a far more tasteful and timeless approach to Macramé which includes elaborate fringes for curtains and tablecloths, bags, cushions, Christmas Tree decorations, tablecentres and tassels! They also make figures out of Macramé, like Nativity scenes and angels and even animals, flowers and monograms! 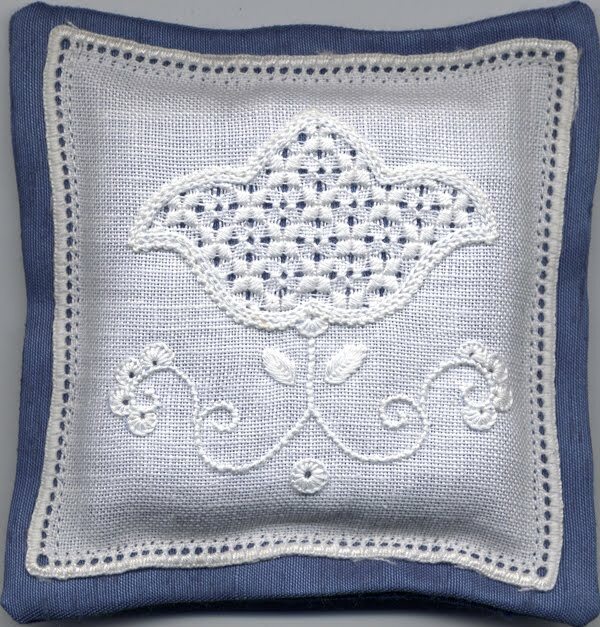 I remember my mother attaching her work to corkboard or hanging it from a doorhandle and sitting on the floor... Italians have it all figured out, they have many different cushions for making your Macramé on and I have to say they are very comfortable to use, you won't go back to going without one! It was an intense 2-day course which lasted all day... I mean all day! Our tireless teacher Liliana Babbi Cappelletti held the classes in her home and served lunch and dinner. 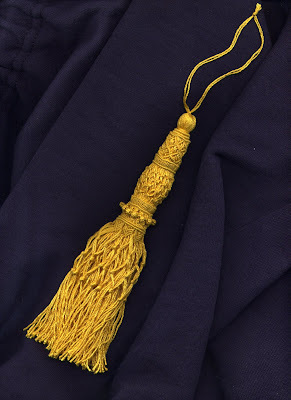 We practiced using different threads, from raw jute to pearl cotton, then we worked the tassel. I didn't get finished and had to complete it at home but it all worked out in the end. Lilli's instructional books are incredibly detailed and very easy to follow. 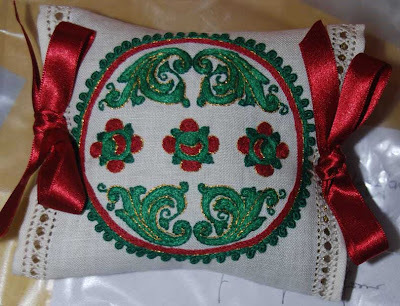 When I first started researching Italian needlework I had a long list of names that I had taken off of an Italian stitching website which was in Italian (of course). I had no idea if these names were "Italian" techniques or just the Italian names for techniques from other countries. This was one of those times when the technique I was researching was not in fact an "Italian" technique per se... Ricamo d'Assia is the Italian term for Schwalm Whitework. What I did discover however, was that it is immensely popular in Italy and there are lots of embroiderers there who do it. I got a little sidetracked by seeing so many lovely examples of this embroidery done by Italian ladies that of course I even had to try a bit myself. Last year when I was in Italy I couldn't help myself and just had to get a book on Ricamo d'Assia as it was written by an Italian embroidery teacher. Guida al ricamo d'Assia is packed full of colour instructional photos explaining over 30 stitches. 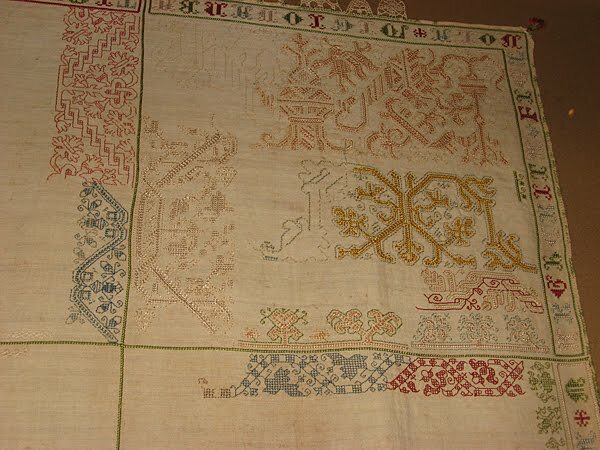 There are projects with varying levels of difficulty and even a bit about the stitches that surround the traditional motifs. The text is in Italian but the photos and diagrams are so good that you'll be able to figure out what to do without the written instructions. You can get it direct from the author Stefania Bressan. 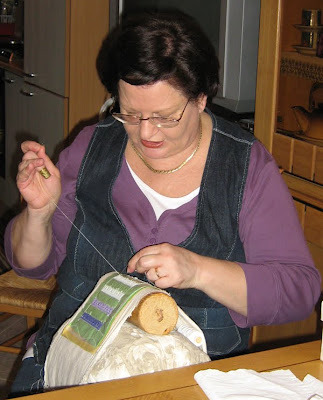 There is a book review at Tuttoricamo under "Books" and then "Pulled Thread and Schwalm Embroidery". I mention this technique here because it did have me researching it for awhile before I figured out what it was, so if anyone else out there happened to wonder, now you know. If you're anything like me though, you are easily distracted by beautiful embroidery and this is well worth a look from the Italian point of view. Many people flock to Siena, Italy for the Palio horseraces each year. There is one on the 2nd of July and one on the 16th of August. The prize for winning is the Palio itself which is a painted banner. The right to parade the streets with this banner is the most coveted honour in the city. There is great excitement which builds all year long for these events and periodically throughout the streets of this walled city, you can observe boys in medieval-style costumes from the different Contradas parade, playing the drums and throwing flags in the air. Siena is composed of 17 Contradas [districts]. The costumes are very colourful and most have some kind of needlework on them. It is difficult to see this as the boys parade by and you can never stop them in their march so the only option for you is to go to the Contrada Museums. Each Contrada has it's own museum located within its district. They have strange hours and you are well advised to make an appointment to go through but it is worth the effort if you are into clothing or embroidery. There are several key positions for parading and each position has its own Palio Costume. 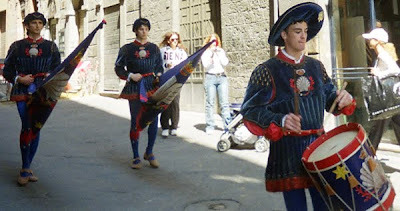 The alfieri [standard bearers] and the tamburini [drummer boys] are the ones you will notice the most as they are usually the ones in leading positions. The blue outfits seen here are from the Nicchio [Shell] Contrada and are modeled after designs made in 1928 by Umberto Giunti. The fabric is blue silk velvet lined with red silk satin, quilted in rows on the lower body. The tops of the sleeves, neckline, along the sleeve openings and above the hemline are all embroidered with gold thread. The crest is applied and was done in silk shading embroidery with silk threads on silk fabric. There are many other times that they will parade to mark different events in the city but the dates above are always fixed. 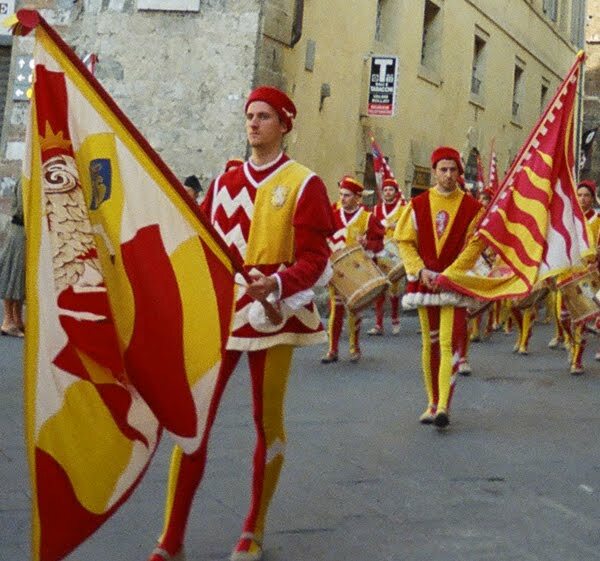 Of course, if you attend one of the two Palio races themselves, then you will see many different styles of costumes as there will be other positions represented and they all parade around the Piazza del Campo in the hours before the race. There are some tens of thousands of people crowded into the square however and you may not be able to see that much, this is why a trip to the Contrada Museums is such a good opportunity. I absolutely love this technique so you will probably read a lot about it here. Known under many names, Punto Toscano, Punto Reale, Punto Riccio and others, the term Punto Antico seems to be a relatively recent (early 20th century) name used to encompass needlework that uses the basic elements of this technique: Satin Stitch motifs, Curl Stitch curlicues, Overcast Stitch for bordering Openwork and Drawn-Thread work areas, Four-Sided Stitch, and very often Gigliuccio hemstitching. It is often paired with Reticello, Aemilia Ars and Punto in Aria needle laces. 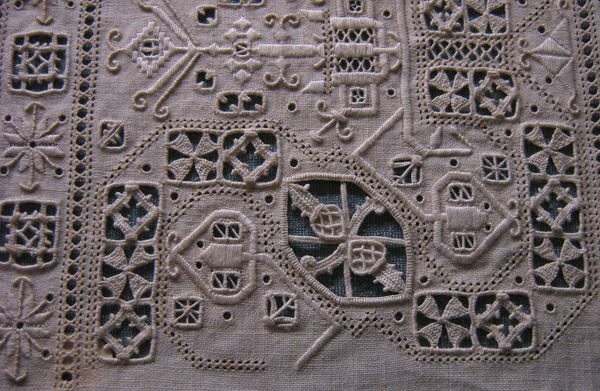 Today it is largely done as a Counted Thread Technique but in the past (as even now) some do it as a classic embroidery technique, that is with traced designs on the fabric to be executed not by counting ground threads. Going through the museums all over Italy I found extant pieces of this technique dating back quite far. There are pieces of fabric with Punto Antico elements on them dating back to the late 15th century. The pieces are quite complex suggesting that the technique goes much farther back in time. Ancient pieces have almost the whole surface of the fabric covered in stitching while modern pieces are quite sparse in comparison though done with no less good taste. I like the texture, the bas-relief effect, it seems to me like carved marble. 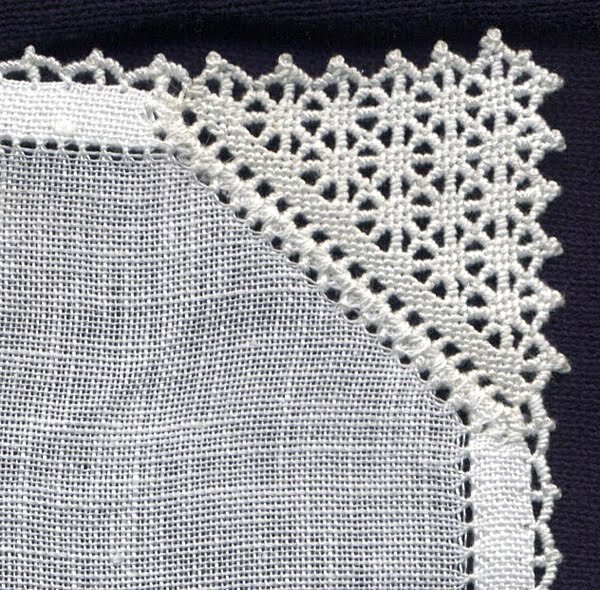 The openwork spaces balance the textured areas using chiaroscuro effects so that this mainly monotone embroidery does not suffer in the least for lack of colour. The curlicues are my favourite element. 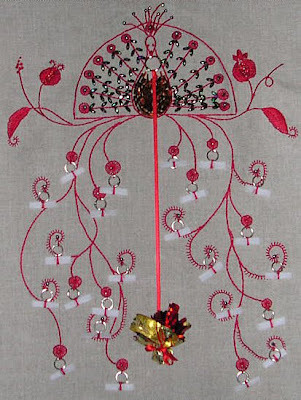 As with any embroidery technique, there are a number of ways to execute the stitches. 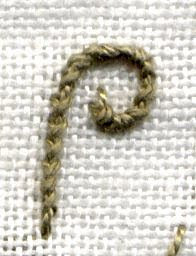 Taking the curlicue (Punto Riccio) as an example: it is executed in three parts with a base of Double Running Stitch (or Stem Stitch or Cable Stitch or Back Stitch) which are then whipped with an Overcast Stitch for each base stitch and then the whole line is covered in Overcast Stitches done side-by-side to create a wonderful raised stitch. Time consuming? Yes! Worth the effort? Very much so! It takes a bit of practice.. Here's what they look like over Stem Stitch with only one Overcast Stitch per Stem Stitch (overcast the overlap) ... This gives quite a different effect which is nice too. Anyway, its a fun stitch to play around with, giving your work some texture. There are some Punto Antico online tutorials at Tuttoricamo under the "How it's Done" section (Antique Stitch). While you're there you can download some old books on the subject from the "Books" section: look under 'downloadable Antique books' - L. Vannini, there are three there. I did a couple of articles for Piecework which are available for download from their website. Associazione Il Punto Antico (all books are either in Italian/English or come with English inserts upon request). Tombolo Disegni (click "books", "libri ricamo", "ricamo italiani" - you need to send an email request to order) There you will also find a book called Punto Antico disegnato which is not a counted thread technique book but rather designs for traditional freestyle or non-counted thread, Punto Antico embroidery. Most of the Carmela Testa books at Iva Rose also have some elements of Punto Antico in them though the instructions are a bit vague. Check out YouTube as there are some tutorial films there too! Sorry folks, it looks like there has been a lot of activity here today, but it was just me doing some maintenance. I was trying to consolidate and streamline the labels for each post. I'm not happy that there is a limit of how many labels you can list for each post... I had hoped to use the labels as a quick reference on the homepage, and I still will do that but it will be incomplete as sadly sometimes I have talked about too many different things in one post. I will try to make that more comprehensive from now on. If you happen to be in Italy before the end of June and you are interested in Renaissance tapestries, you really should go to Mantua. Besides the fact that it is a beautiful city, rich in history, art and architecture and where there are far less tourists than in other places; from March 14th to June 27th, 2010 there will be an exhibition of The Gonzaga Tapestries from the Renaissance. From Mantegna to Raphael and Giulio Romano. A friend in Mantua tells me there are two exhibitions; one at the Palazzo Tè and one at the Ducal Palace. The exhibition at the Ducal Palace is a permanent exhibition but if you're going for the tapestries, you should really go to both! I had the opportunity to see the Ducal Palace a few years ago, but didn't make it to the Palazzo Tè... well, we went to the bookshop... but the museum was closed for the day. I'll just have to go back with more time to spare! More information (in Italian) on the exhibition can be found here. If you go to the Art Newspaper's website and click on the heading "The Gonzaga Tapestries" under 'Mantua, Italy/Museo Civico Palazzo Tè', there is some information in English. At some point I decided to start a library and collect all the books I could find on Italian Needlework. This was (and still is) an expensive endeavour as usually I end up paying twice the cover price of the book because the shipping costs from Italy are so high. Long ago I told myself it was worth it and so I stopped being freaked out by costs and learned to treasure my books for the individual delights that they are. Sure I sacrifice, I don't spent a lot on going out to restaurants, etc. so I allow myself the cost of building my library. I try to limit myself to those books I would really like to have but once in awhile I splurge and buy ones that are just great eye candy. The first old book I bought was one year at Christmas. 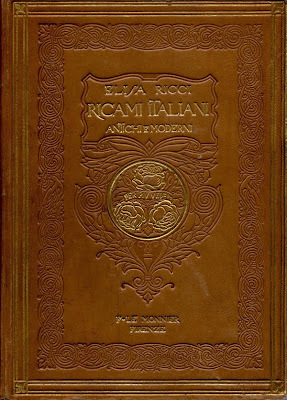 An original 1925 edition of Elisa Ricci's Ricami Italiani Antichi e Moderni, Le Monnier, Firenze [Italian Embroideries, Ancient and Modern]. This book is outrageously priced at antique book stores in Italy but I happened across a copy being sold from England for about half of what it was usually going for. I don't even remember where I purchased it from but it wasn't through Ebay or any of the big book chains. The bookstore told me that it wasn't in great shape but that it had all it's pages. That was good enough for me. I told myself it was an essential book to research on Italian Needlework and that sooner or later I would have to have it – and I might never find it so "reasonably" priced. Ah! ...the ways we can justify things to ourselves! I worried and sweat for a month waiting for it to arrive. When it did I understood the shipping costs as it weighs 3.5 lbs! Hardcover, embossed and gilt. I didn't own anything like it. It is kind of worn away around the edges and two pages were folded over. Other than that, it is pristine. Moreover I don't think anyone ever really studied it. The pages are clean on the edges and there were even four pages that hadn't quite been cut apart properly so that they were still attached to the preceding one at the top edge. And the contents! 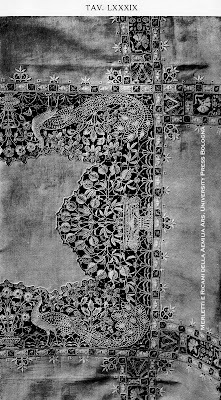 I had never seen one book with so many different Italian embroidery techniques and though the photographs are all black and white, there are a great many of them. Of course the text is in Italian and so I had to set about researching some embroidery terminology translations but in the end it has and still does given me countless hours of enjoyment. A few years later an Italian woman who was (still is!) researching the life and work of the author was able to have this text reprinted in a smaller paperback format. She enriched the text with a detailed index and it is the copy that I use most for research now. I still take the original edition out quite often as the pictures are larger – being that the book is much larger – so I can get out a magnifying glass and really study the details. Oh I was so hooked after that on old books! Since those days, the internet has opened up many opportunities and it is much easier now to spend my money. I also now know a bit more about what I'm looking for. Now I have to weigh the pros and cons of each purchase... is it out of copyright and available on websites like the Antique Pattern Library or the Digital Archive of Documents on Weaving and Related Topics? How much of the content is text and how much is patterns or pictures? Will I be able to easily find another copy another time? Other things to consider are things like: does it come from a smoke-free environment? Has it been kept in a moldy basement? If these things are important to you, ask the bookseller. I once bought a stitch encyclopedia that had to sit outside in a bag with a carbon filter and a bag of coffee beans for a really long time before I could handle leafing through it. Best of all old embroidery books give us a window to the past. A different way of life, a slower pace. A time when there was more opportunity to embroider, and more things to be embroidered! Please note that most of these website also sell modern books so watch for publication dates! 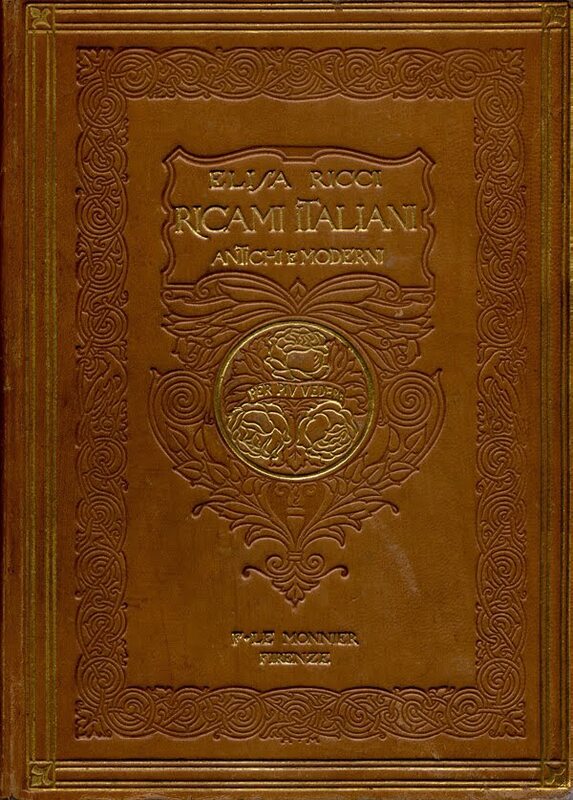 You can learn more about Elisa Ricci at TuttoRicamo under the headings "History" and "Prominent Characters", you can also read a review of Ricami Italiani Antichi e Moderni in the "Books" section under "Antique Books" (right hand side of the page), click on "comments". In the spring of 2007 I packed up my daughter and we went to Italy. It was her first time and I dragged her all over before abandoning her with the kids of embroidery friends of mine so I could enjoy the Italia Invita Lace and Embroidery Forum in Rimini. I thought it was a good deal. I spent nearly two weeks agreeing to her every whim so that in the end, all she had to do was hang out with friends while her mother went crazy. We'll talk about how crazy I went in another post! The sign read "embroideries and restorations"... we were intrigued but alas could not go in. In the photo you can just make out some needlework pinned to the wall on the right-hand side. They were lovely drawn-thread works. 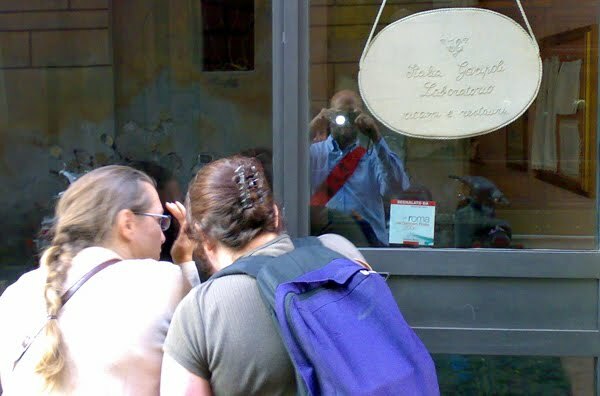 The next time I was in Rome was in 2009 and this same friend took us to a different shop near Piazza Navona, Le Tele di Carlotta in Via dei Coronari no. 228, where we met the owner Simona Virgilio and observed a one-on-one lesson being given to a girl who'd come from France to learn Reticello. We bought some lovely pieces of Italian linen there! Downtown near Piazza Venezia there is Canetta in Via IV Novembre n. 157/B, they are the company that publishes the embroidery magazine Mani di Fata and here you can get fabric, books, patterns and stitching supplies. I have only peered into the window of their shop in Milan, but they seem to have lots of embroidery stuff. 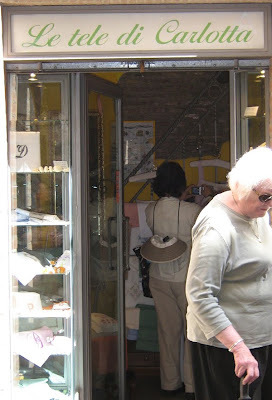 Then there are many textile shops along Via delle Botteghe Oscure near the Ghetto in the Largo Argentina area. A little ways out of the "downtown" area (you can take the metro and it is apparently well worth the trouble) there is Rinaldi-Decoricamo in Viale di Valle Aurelia no. 61. I would really like to visit the embroidery school/laboratory CBC Needlepoint in Via Confalonieri n. 1. They do some absolutely stupendous goldwork embroidery. Please leave a comment if you know of other stores! Check out this post for more shops in Rome. 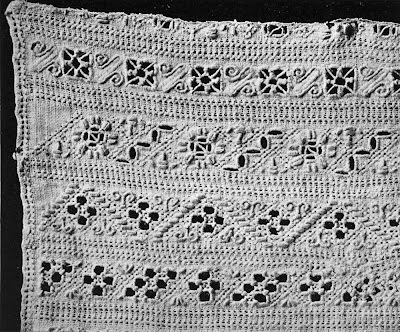 In the book Merletti e Ricami della Aemilia Ars (1929) which is a celebration and showcase of the laces made by the Aemilia Ars Society of Bologna in the latter part of the 19th and beginning of the 20th centuries, there are so many incredible laces that one becomes quickly desensitized. You must take each piece and study only that one, every time you open this book in order to appreciate and even to notice how amazing each individual lace is. Every piece represents more than countless hours of painstaking work, every piece reflects the imagination and talent of it's maker and carries the history of Bologna, needle lace and Italy really. Nothing, nothing looks like it. There are other types of needlelaces, and they each have their own styles – not to say that they aren't breathtaking in their own beauty either... but there is some kind of soul in Aemilia Ars lace. If you let yourself really look at it... it is alive. The moveme nt of the designs, the designs themselves – flow somehow. It is difficult to describe how I feel in front of it. Mostly I have to remember to keep my mouth closed as it is frequently opened in awe. My mother's quick backhand is forever imprinted in my brain so I keep my hands firmly clasped behind my back but I lean in very close and try to absorb everything. Where was I? Oh yes, the book... among the myriad of stunning pieces there is a tablecloth. Such a tablecloth it is! It was called La passeggiata dei pavoni [the promenade of the peacocks] and was executed from a sketch by Alfonso Rubbiani (1848-1913). The centre measured 2.4 x .62 metres and the whole tablecloth including criss-crossing borders wa s 5.2 x 2.2 metres. That's a little more than 17 x 7 feet! Can you imagine producing feet of needlelace?!? The tablecloth was first produced for 'Mr. Vanderbilt and then again for Mr. Bache, both of New York'. It was produced twice. If I could only study one piece of Aemilia Ars in my life, this is the one. There are 12 peacocks in the centre, 2 fountains, 2 big vases with grotesques and 8 smaller vases containing many types of flowers, leafy branches, pomegranates, acorns, grasses, wheels and picots galore! Flowers my untrained eye recognizes are roses with carnations down the sides... there are many flowers and forms that I have no names for... lozenges, curlicues and even 8 capital Vees (for Vanderbilt, I assume). I thought that surely this would be easy to find, being such a thing of beauty, the family members of the Vanderbilts and the Baches would surely have treasured these tablecloths. I embarked on a search. I wrote to all the Vanderbilt museums and after a bit of research I found that Mr. Bache's things eventually came to be the property of the Metropolitan Museum. Not one museum answered my queries. Fair enough, I'm sure there are lots of people doing research and they must be busy. I cannot however get to New York to investigate myself. A very kind woman at the Smithsonian confirmed that they don't have it and she was kind enough to send me photos of what they did have which we'll talk about in another post. I poked around investigating old newspaper clippings regarding the Vanderbilts and found a notice of a devastating fire in which much was lost including "many linens". This makes me just ill to think about. Could this piece of art have been lost to fire? Short of trying to contact Anderson Cooper to see if he or his mother have the tablecloth in the linen closet, I'm out of ideas. "Grandma I'm getting married and I would like a gift: the promenade of the peacocks." It goes on to say that she (the granddaughter) asked so simply and that her grandmother responded just as simply: You're mad! However, the gift was designed and made by Grandma just the same. I imagine that the granddaughter must have sobbed with joy. The following page in the book shows the newer version of the 'Promenade' – only a touch simpler and no less beautiful – the same size as the original. Many books on Italian needlework were written by Adele della Porta in the early part of the 20th century. I thought it might be interesting to find out a bit about this woman who wrote so much. Initial searches on the internet turned up nothing but every now and then I check out all the links I can which quote her name. I wish I could search genealogy records in Italy in person, but that is not possible at this time so lets just say that for now, this in an incomplete biography. Adele Colombini was born in 1859. She married Augusto Mazzucchetti, a journalist and writer, and had two children: Mario and Lavinia. Mario died at 23 in 1910 from typhus. Both her family and her husband's family were Milanese but I can find no data as to whether that means the city of Milan proper or it's surrounding area. I cannot find a marriage date either. Due to the political connections of her husband and his involvement in the emancipation of women, she was able to publish her writings with the Sonzogno publishing house of Milan. She assumed the pseudonym of Adele della Porta and compiled and edited books and magazines on women's fashion. She gradually became the director and managing editor of the magazines: La Novità, Il Ricamo, La Moda Illustrata, La Moda Illustrata per Bambini, La Biancheria Elegante and Parisienne Grande Mode. It seems her daughter Lavinia, then a high school student, helped her mother with both the compilation and translation of foreign texts especially those in French and German. Lavinia would go on to become an important literary scholar, critic and translator. Adele died in Milan in 1948, she was predeceased by her husband who died in 1914. I have been able to compile a list of the books that she wrote, edited or illustrated for the Sonzogno publishing house. Please leave a comment if you know of errors or other publications that I may have missed. Some of these are available for download at Tuttoricamo, as they are no longer covered by copyright laws. Some can be found occasionally on Ebay or its sister site Italian Ebay. There are a couple of digital copies for sale here. One day I hope to have them all in one form or another as they are valuable resources in the research and understanding of Italian Needlework. One day I hope to know more about this incredible lady who assembled all this information. Ricamo con nastrino Graziella, 19? ?